I can't believe Christmas is only a few weeks away! Where has this year gone?! Now as much as I love Christmas and the build up to the big day, I do find the whole Christmas shopping element a little bit stressful. I have a huge family so coming up with gift ideas for everyone whilst trying not to spend thousands (as much as I wish I could) can be a little tricky. I always find myself getting stressed and panicked by how much I need to buy and usually always leave it until the last minute to go on a mad shopping spree. Not ideal I know - not to self, be more prepared. 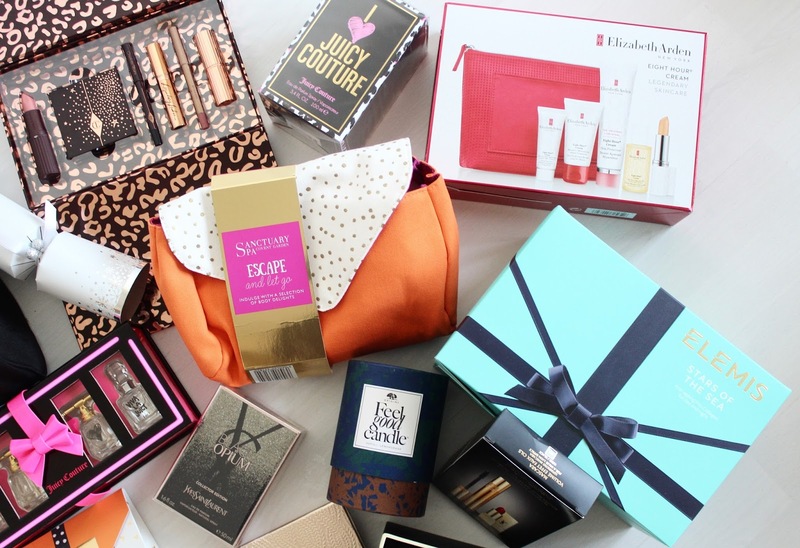 One thing that does help me with my Christmas shopping is all of the fabulous bloggers sharing Christmas gift guides. I personally love reading them and getting lots of ideas which is why I put my own together every year. 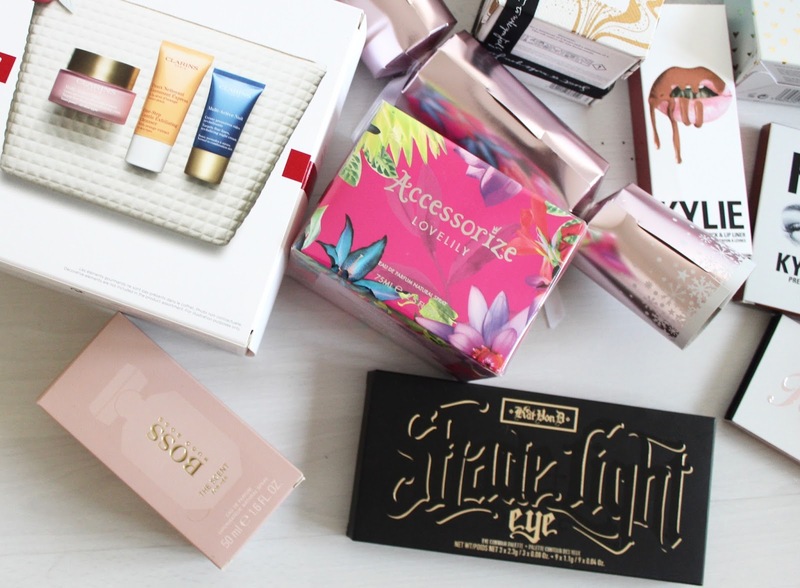 With this being said, here's my first gift guide for the ladies in your life. If like me you have a mum, sister, nanna or girlfriend that love pampering themselves and beauty products, you can't go wrong with the gifts I'm about to show you. I've linked them all directly to the retailers too which should make your Christmas shopping that little bit easier. I hope you enjoy and do let me know if you buy any of your loved ones one of these suggestions as I'd love to know! MUGLER 'Angel Muse' eau de parfum Christmas gift set - Who doesn't love receiving a fragrance gift set at Christmas? It's one of my favourite gifts to receive and this Mugler set including the Angel Muse fragrance and mini handbag size miniature makes for the perfect gift. I love the blue and copper packaging too! Yves Saint Laurent Mon Paris Eau de Parfum - A beautiful scent in a beautiful bottle - you can't go wrong, can you?! If you love a sweet and fruity scent, this is the one for you. Clarins Multi-Active Smoothing Essentials collection - This fab little set from one of my favourite skincare brands includes the Multi-Active Day Cream 50ml, the Clarins One-Step Gentle Exfoliating Cleanser and the Multi-Active Night Cream 15ml. Perfect for fans of the brand or those who love treating their skin - I can vouch for how great all of the products are! Yves Saint Laurent Babydoll luxurious mascara Christmas set - For all the lovers of YSL beauty products, this is the perfect little set. It includes a full size baby doll mascara, minature eyeliner and mini top secrets instant moisture glow. Not to mention it comes presented in the most beautiful sparkly black box. Elemis Joyful Glow Candle - If you want your house to smell like a luxury spa, Elemis candles are the way to go. This is one of their Christmas scents with notes of Vanilla, Orange and Cinnamon to leave you feeling relaxed over the festive season. Neom Christmas Wish Candle - One of my all time favourite Christmas scents and perfect for any candle lover. Presented in a beautiful gold jar, it will add a bit of festive sparkle to anyone's Christmas. It also fills the room with the most beautiful spicy festive scent and has 50 hours burn time. St Tropez Weekend Getaway Kit - For the fake tan lover, this is the perfect little gift featuring a mini bottle of the famous Express One Hour tan and a tanning mitt, it makes a great stocking filler and will get the lady in your life ready for her Christmas and NYE partying. Juicy Couture House of Juicy Couture Deluxe Minis Gift - As I'm sure you all know (I've only mentioned it about 100 times on my blog), Juicy Couture is my all time favourite fragrance brands and I've owned and used their perfumes since I was a teenager, even naming this blog after my love of the scent. This gift set including four of their beautiful fragrances in mini sizes is perfect as it allows you to wear a selection of their scents without the price tag of buying all the full size bottles. Sanctuary Hands and Feet Treat - Featuring a mini hand and foot cream, this is the perfect little set for anyone who deserves a pamper this Christmas. I personally love receiving items like this as gifts as it's something I'd never normally buy for myself. They're the perfect travel and handbag size too! Yves Saint Lauren Black Opium 50ml Christmas Collector Edition - If you're a fan of YSL's Black Opium fragrance or know someone who is, this limited edition Christmas collector bottle is a must have. Presented in the most beautiful ombre glitter bottle, it's pretty special. bareMinerals 'Glow Together' complexion finisher palette - For the makeup lovers, this bareMinerals palette is a great gift. It includes three cheek products to brighten the complexion - 'Gilded Glow' is a champagne highlight shade, 'Rose Matte' is a dusky pink blush and 'Amber Glow' is a lovely warm bronze. It's a great little kit for those who do lots of travel and on the go makeup applying. 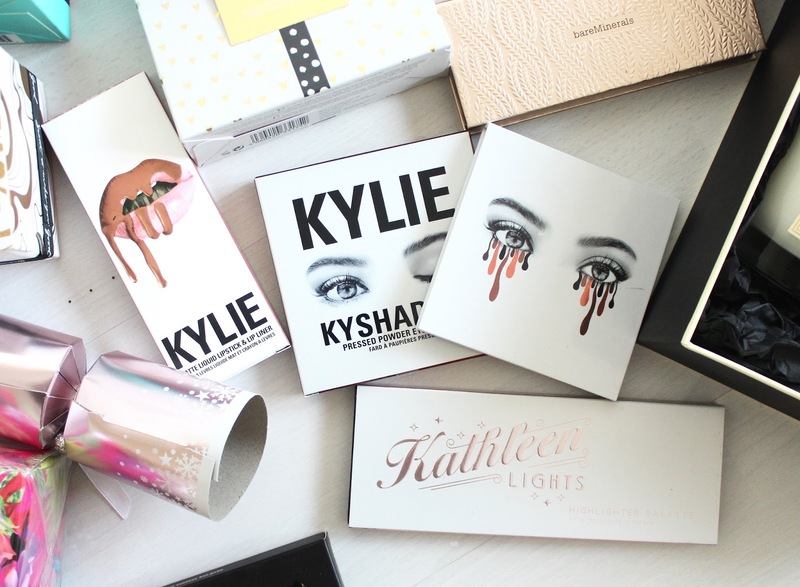 Kylie Cosmetics Products - As I'm sure you all know, the world has gone made for Kylie Cosmetics over the past year and I can't see the obsession stopping anytime soon with Kylie releasing new and exciting additions to the range on a regular basis. One of the most recent additions was her two Eyeshadow palettes and I think this would make a great gift for anyone who loves makeup and is a fan of the Kardashian clan. I've got the Bronze palette which has 12 beautiful warm neutral shades - perfect for anyone who loves a neutral eye look. One of the lip kits is another great gift as they're Kylie's original and most popular product with a colour to suit everyone. Makeup Geek Kathleen Lights Highlighter Palette - I'm a big fan of Kathleen Lights Youtube channel, as I imagine many others are so if you know someone who is a fan, her highlighter palette in collaboration with Makeup Geek that features three beautiful shimmery powders will make the perfect Christmas gift. Jo Malone Gift Christmas Gift Sets - This isn't a specific gift set you can buy but I had to include Jo Malone in this gift guide regardless as it's one of my favourite brands to receive as a gift. There's something so special about Jo Malone and because of the high price tag, it isn't something everyone can afford to buy for themselves on a regular basis making it the perfect present. Here I have the Mimosa & Cardamon candle (my absolute favourite Jo scent) and the Peony & Blush body cream - both of which are beautiful and completely luxurious products. Accessorise Lovelilly Perfume - I didn't even know Accessorise had a fragrance until this lovely bottle of 'Lovelilly' arrived at the door. I always think these kind of fragrances are great stocking fillers as they aren't as expensive as your big name brands and they're also great for the younger members of the family who are just starting to experiment with wearing perfume. Hugo Boss The Scent For Her Eau De Parfum - When I think of fragrances, Hugo Boss is always one of the first that comes to my mind, especially for Men. However, their female fragrance is just as beautiful and this new scent for her is divine! It's a lovely light and feminine scent, one I'm sure all women will love. Kat Von D Shade & Light Eyeshadow Palette - Kat Von D is such a lovely brand and only that has only recently become available to buy in the UK so what better time to treat someone to this stunning palette?! The Shade & Light palettes are absolutely stunning with the face palette being one of my favourites to contour and highlight with. This eye palette is just as beautiful with twelve matte shades split into three categories to create three stunning eye looks that define the eyes. 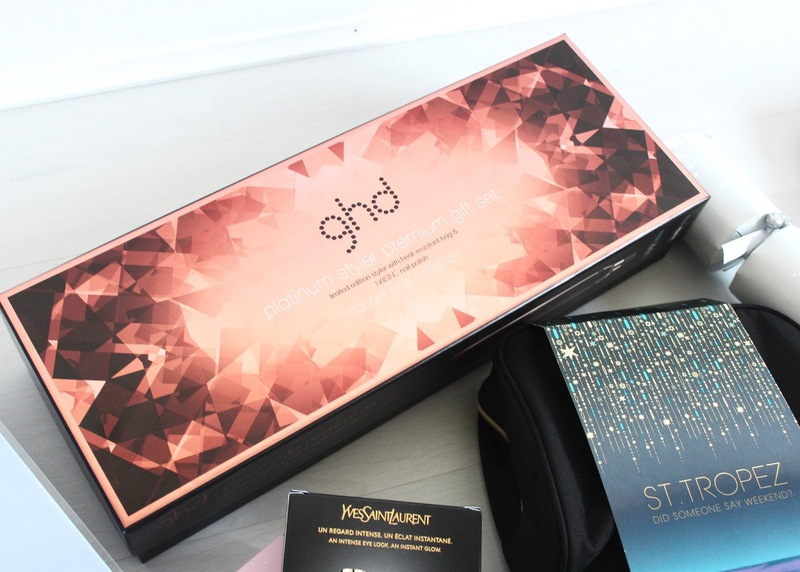 ghd Platinum Styler Premium Gift Set - Oh my goodness, copper ghd straighteners?! Yes please! 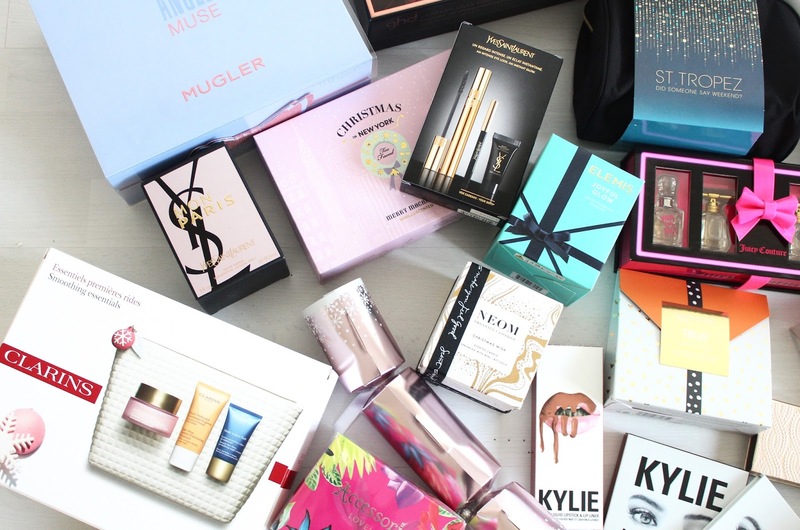 I don't know one girl (or guy actually) who wouldn't be happy unwrapping these on Christmas morning. This set includes the platinum straighteners in a beautiful copper shade, a bag to keep them in and two copper nail polishes. Sanctuary Escape and Let Go Gift Set - Another great stocking filler from Sanctuary Spa. This lovely gift set includes a body wash, scrub and butter, all in the beautiful White Lily & Damask Rose scent. I always love receiving these kind of sets and stocking up my bathroom cabinets with lots of pampering bath and shower products. I Love Juicy Couture Perfume - As I mentioned earlier, Juicy Couture perfumes are some of my favourites and I particularly love their new I Love Juicy scent. The packaging is always very theatrical and this one is no different with its leopard print bottle and crystal embellished lid. It's definitely one for the glam girls in your life! The scent itself is fruity, feminine and all kinds of fabulous - just as beautiful as the bottle itself. Elizabeth Arden Eight Hour Cream Beauty Gift Set - For anyone who suffers with dry skin, the Elizabeth Arden Eight Hour Cream is bit of a miracle worker as it soothes roughness, redness and minor skin irritation. It can be used for a whole host of skin ailments. This gift set includes the - Eight Hour Cream Skin Protectant 50ml, Eight Hour Cream Lip Protectant Stick SPF15, Eight Hour Cream Intensive Moisturizing Hand Treatment 30ml and Eight Hour Cream Intensive Daily Moisturizer For Face SPF 15 so you get a whole range of products to keep your skin in tip top condition! Charlotte Tilbury Dreamy Look In A Clutch Gift Set - If you want to buy a makeup lover something really luxurious, then look no further than this Charlotte Tilbury set. It contains an eyeshadow palette, lipstick, lip liner, eye liner and mascara so there's virtually a full face of makeup in there minus the base and brows of course. Charlotte Tilbury products are great quality and always such a treat to receive so this is the perfect gift if you want to treat someone to some nice makeup. Elemis Stars of The Sea Gift Set - I obviously had to include an Elemis gift in this post as they're my all time favourite skincare brand. This gift set is lovely as it includes their famous Pro-Collagen Marine Cream and Pro-Collagen Oxygenating Night Cream, both of which are super hydrating moisturisers and perfect for all skin types. Origins Feel Good Candle - I actually have this candle lit whilst writing this post and it's so beautiful. It has a really strong scent of Neroli and Lemongrass that fills the whole room as soon as it's been list. Origins have a few different scents of the Feel Good candles and they're all limited edition for Christmas so grab one while you can. I hope you enjoyed seeing my top gift picks guys and hopefully it gave you a few ideas for those last minute shopping sprees. I've done most of my shopping online this year as I can't handle the madness of the shops at this time of year - it's way too stressful! I just can't wait until the big day so I can dish these goodies out to my family, yay. What's on your Christmas wish list? 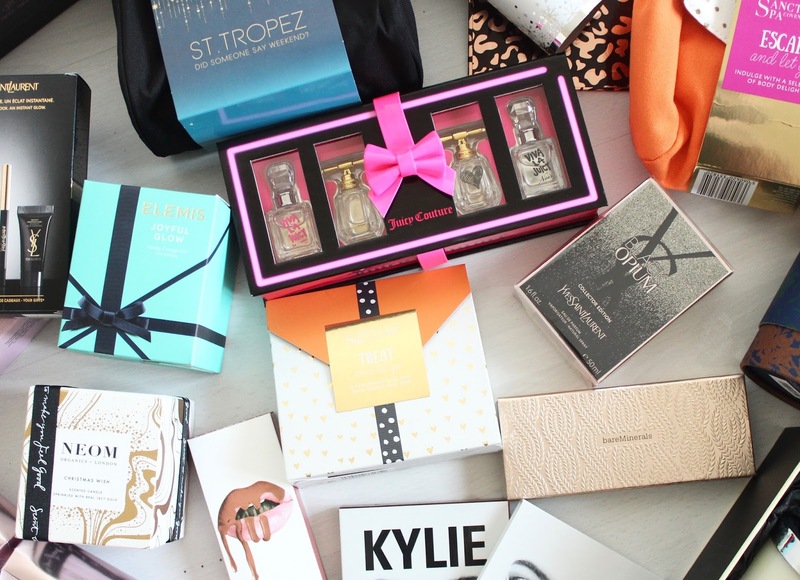 Anything in this post you'd love to receive on Christmas day? i love the charlotte tilbury set ! i think that this is a great value for someone who want also to be introduced to the brand. Such cute gift ideas! I will have to try a few of these! Literally want everything on my list haha!! This did however give me some ideas I have a few tricky people left to buy for and needed some inspiration so thank you!! Jo Malone goodies under my Christmas tree would be fab! 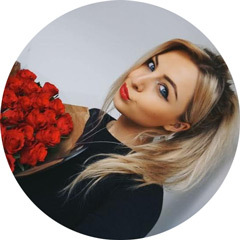 Hi lovely, I absolutely love your blog!! I can only wish that one day my blog will be as big as yours. You really inspired me to get started! Candles are always such a good ideas for Christmas gifts!! 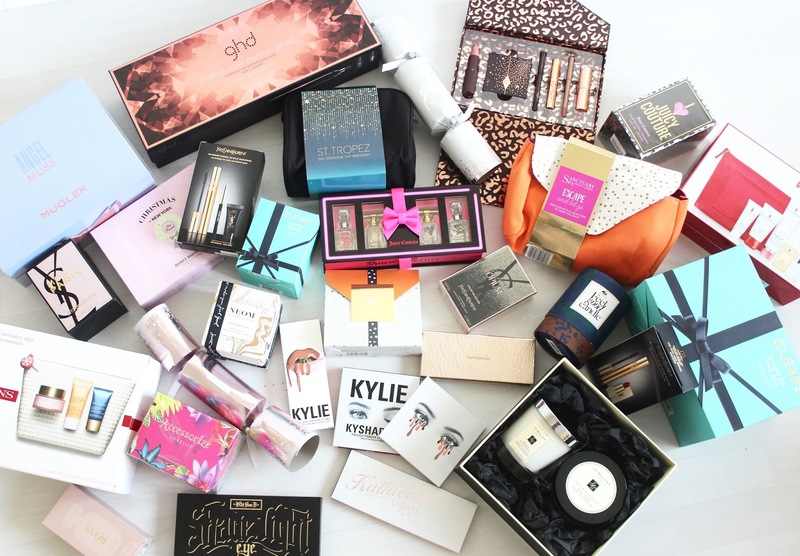 All of these products sound like great gifts! You've got some amazing picks here, I'd love to receive any of them!